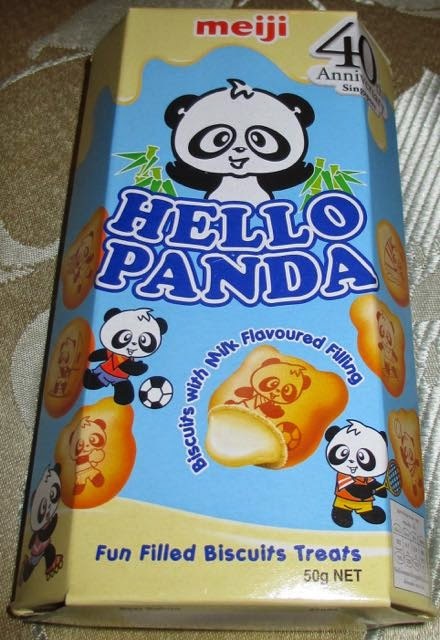 When I first saw these Hello Panda Biscuits with Milk Flavoured Filling in the supermarket I noticed it said 40th Anniversary on the box. So happy anniversary Meiji Seika! I figured "milk flavoured" meant milk chocolate, but only when arriving home and checking the ingredients did I notice that there was indeed no cocoa in them. Wow! These biscuits really are milk flavoured. Sounds kind of dull, but on opening the packet these cute decapitated panda head biscuits with cute images of the trademark panda doing various sports had a luscious milky biscuity smell to them. There were plenty in the packet too. The biscuits had a soft crunchiness and had a soft milky sweet centre. I was surprised there was no vanilla in the ingredients either, as they tasted like a mix between vanilla and chocolate. The light sweetness amongst the strong milky taste was provided by the sugar and caramel in the ingredients. I certainly didn't find these cute panda head biscuits dull at all. They were a tasty fun treat, and I'll definitely pick up another box when I'm next in the supermarket. 50g net weight. Per 30g have 158 calories with 8g of fat and 8.8g of sugar. Produced by Meiji Seika in Singapore. Contains; gluten, milk, soya and possibly traces of Hazelnut. See photograph for ingredients.